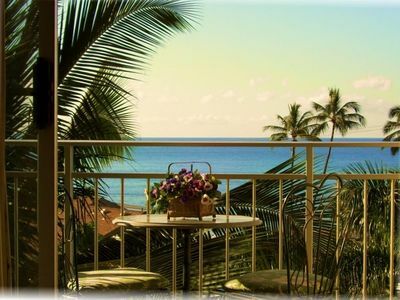 This new VRBO listing is a fully renovated/upgraded and very well furnished/equipped condo located in the Island Surf complex in South Kihei, Maui. 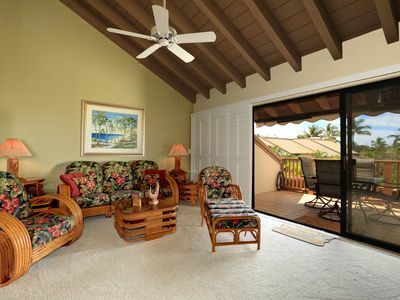 This condo is just a very short walk away from wonderful beaches, restaurants, and shopping. 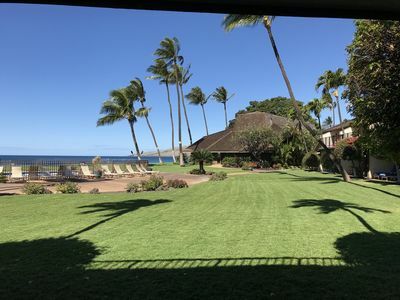 The unit includes two bedrooms (each with a Cal-King size bed), two bathrooms, a fully equipped kitchen, an open living room and dining area, and a lanai that provides a partial view of Cove Beach Park, Kalama Park, and the ocean. 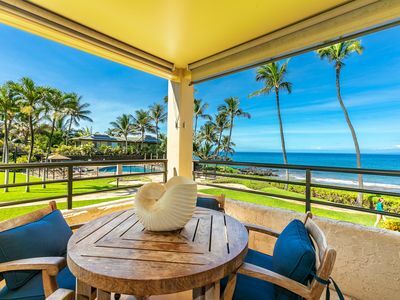 The lanai features bar height table seating, with four chairs, allowing guests to comfortably relax and dine out on the lanai, while enjoying the views and ocean breezes. The unit is designed to comfortably sleep four people. Guests will appreciate new ceiling fans in the living room and each bedroom, as well as a new high-end Mitsubishi split-zone air conditioning system (installed in August 2018), featuring separate modules/controllers in the main living room area as well as in each bedroom. This condo provides guests with quality renovations, furnishings, and appliances, while still offering reasonable prices! This condo is in an excellent location, just a very short walk away from beautiful beaches, surfing, paddle boarding, parks, shops, and restaurants! The unit features tile flooring throughout the entire condo. The kitchen has been fully remodeled with wood cabinets, granite counters, new sink fixtures, and quality stainless steel appliances (including glass top stove, with oven, microwave, dishwasher, and large refrigerator with ice maker). The unit also features a new high-end, full-sized, stacked washer and dryer that is available for guest's use. The kitchen is fully stocked with quality dishware, glassware, silverware, cookware, utensils, and numerous small appliances (e.g., coffee grinder, drip coffee maker, electric tea pot, toaster, blender, rice cooker, crock pot, etc.) 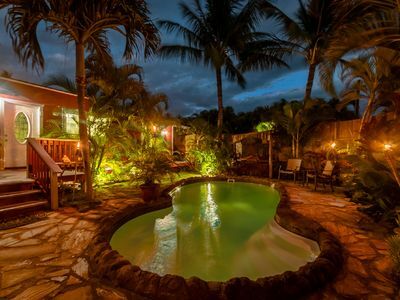 for guests to prepare and serve meals, saving funds for the multitude of other activities and adventures available on Maui. For those who prefer to eat meals out, there are numerous excellent restaurants within walking distance or very short drives. 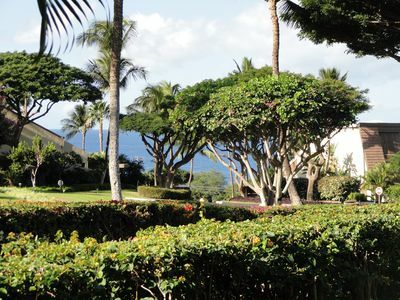 There are many renowned restaurants and chefs to pick from throughout Maui! 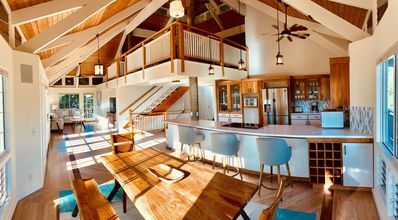 The condo has a large granite island separating the kitchen and living room, with four bar stools available for seating around the island. 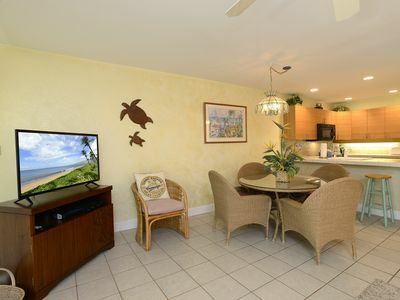 This inside dining area is in addition to the bar height table and four chairs located on the lanai. 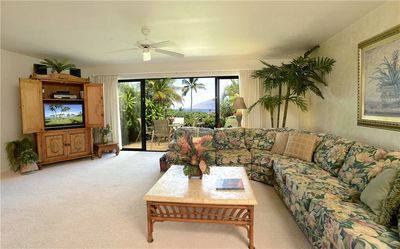 The living room features a large, comfortable sectional sofa, coffee table, and a large HD Smart TV (with separate blu-ray player) providing guests with a place to rest and relax between other Maui activities. 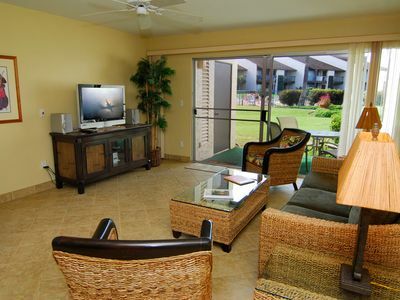 Guests have access to cable TV, high-speed internet, and phone service within the condo (at no additional charge). 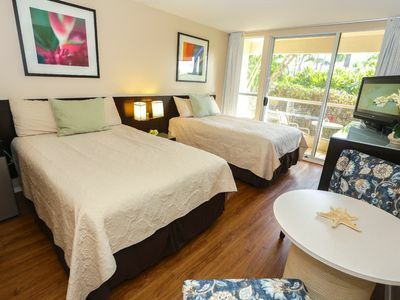 Guests can choose to open the condo's doors and windows to enjoy the views and ocean breezes, or can utilize the new Mitsubishi split-zone air conditioning system to fully cool the entire unit as needed. The master bedroom features a Cal-King bed, individual air conditioner module/controller, a flat screen TV, plenty of closet and dresser space, and direct access to the master bathroom with a combination tub/shower, surrounded by tile, and a brightly lit, tiled vanity area. The master bedroom also features a small kitchenette area with a granite counter, extra cabinets, small refrigerator, and microwave. The second bedroom also features a Cal-King bed, ample closet/dresser space, individual air conditioner module/controller, a flat screen TV, and convenient access to the hallway guest bathroom, including a fully tiled walk in shower and other bathroom renovations. The Island Surf complex provides ample parking for residents/guests immediately behind the building. The complex also features a lovely pool with lounge chairs and tables. There is also a common barbecue area with multiple gas barbecue grills. The Island Surf complex features stairwells (at each end of the building), as well as an elevator in the middle of the building that services all floors. This condo is on the third floor of the building and because it is an end unit, it provides guests with increased privacy. There is a trash chute near the middle of the building for the convenience of guests on the upper floors. The Island Surf complex is directly across from Kalama Park and Cove Beach Park (normally providing excellent beginner to intermediate surfing and paddle boarding conditions). Kalama Park features large grassy areas and many beautiful trees for those who wish to enjoy the ocean views, while remaining in the shade. Beach park facilities include bathrooms, outdoor shower facilities, a children's play area, an in-line skating rink, a skateboard park, sand volleyball courts, tables/benches, and grassy areas for relaxing, having picnics, playing games, etc. 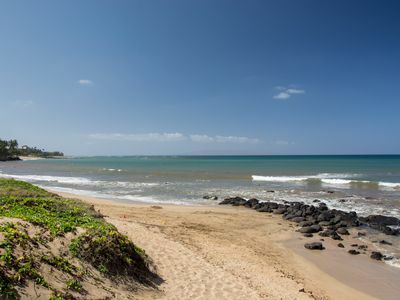 Charley Young Beach and Kamaole Beach Park I are also just a short walk away from the Island Surf complex. 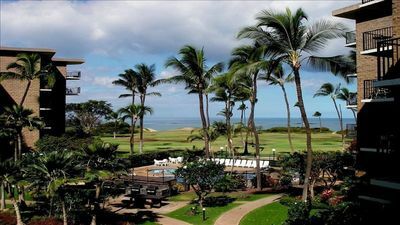 Many other excellent Kihei and Wailea beaches are also just a short drive away from the condo. These numerous, beautiful white sand beaches provide excellent areas for various beach activities and other fun in the sun. 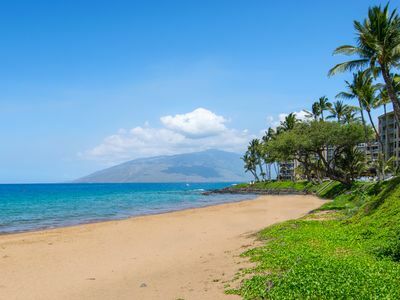 There is free public parking at nearby Kalama Park, Charley Young Beach, and the Kamaole Beach Parks, as well as at many of the other public access beaches in Wailea and Makena. From all of these beaches/parks, visitors can enjoy spectacular views, look for turtles along the shore, watch whales (primarily during the winter months), etc. Don't forget to pack your binoculars for close-up viewing of whales, turtles, etc., from the beaches and shoreline walking paths! 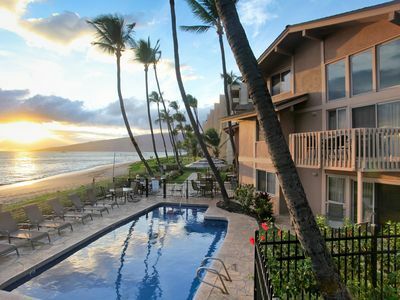 At various locations within Kihei, some within walking distance from the condo, guests can also rent gear (surf boards, paddle boards, snorkel gear, dive equipment, etc.) and arrange for lessons to improve their skills! The owner of this condo supplies guests with beach towels, beach chairs, a beach umbrella, a beach cooler, and some beach toys. Please note that all guests must register upon arrival by leaving a completed registration form in the office next to the elevator. Information required for registration will be coordinated in advance of your stay. For everyone's safety/security, it is important for the on-site property manager to be aware of all residents/guests, as well as all cars that will be parked on the property. All guests must comply with the Island Surf House Rules, intended to ensure the safety, security, and enjoyment of all guests and residents. 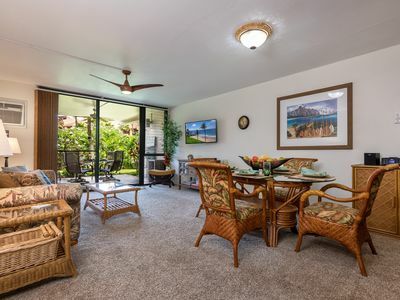 Smoking is strictly prohibited in this condo (including the lanai), and in all common areas of the complex (except for the designated, outside smoking area near the back of the complex, away from the building). 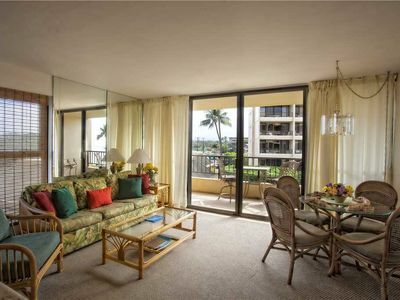 Owners live in Maui and directly mange this condo themselves. If they are ever on vacation and unable to support their guest's directly, they engage a local property manager to fully support their guest's needs. Contact information for the owners (or other property manager) will be provided prior to the guest's arrival. As guests plan their vacation in paradise, they are encouraged to consider purchasing travel insurance addressing potential issues such as trip interruption, loss or damage to personal items, etc. We want all guests to have a pleasurable experience, even if unanticipated issues should occur. 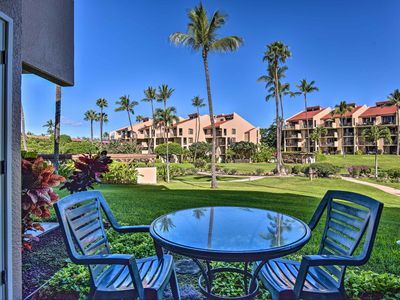 Kamaole Sands, 6-103, walk 2 Beach, garden view, central to dining & fresh air! 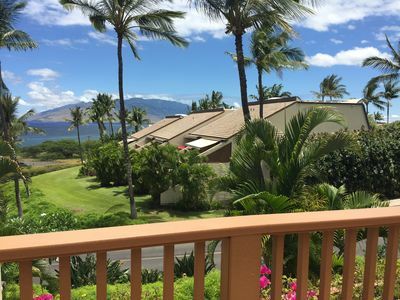 Kihei Sands Beachfront Condo B12 on Maui's Beautiful Sugar Beach! My Perfect Stays: Only $149 a Night! 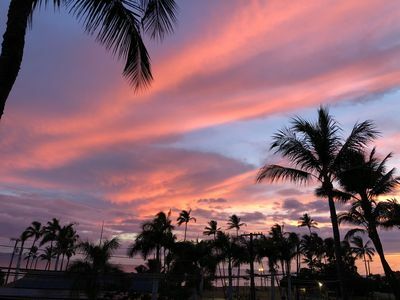 April 27-May 4 SPECIAL -Just Steps to Kamaole II Beach Park! 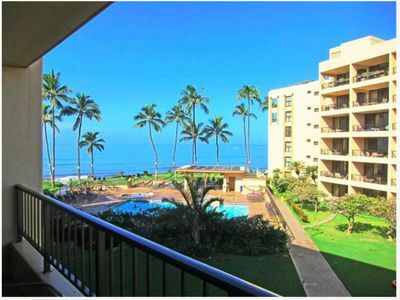 #111 Ground floor condo, easy access to best beach on Maui!